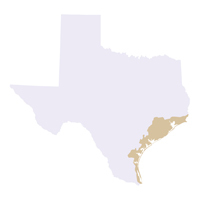 The Gulf Coast Prairies and Marshes region is a nearly level, slowly drained plain less than 150 feet in elevation, dissected by streams and rivers flowing into the Gulf of Mexico. The region includes barrier islands along the coast, salt grass marshes surrounding bays and estuaries, remnant tallgrass prairies, oak parklands and oak mottes scattered along the coast, and tall woodlands in the river bottomlands. Native vegetation consists of tallgrass prairies and live oak woodlands. Brush species such as mesquite and acacias are more common now than in the past. Although much of the native habitat has been lost to agriculture and urbanization, the region still provides important habitat for migratory birds and spawning areas for fish and shrimp. These plants have been identified as particularly worrisome terrestrial invasive species in the Gulf Coast Prairies and Marshes ecoregion. Click on their scientific names to go to the Invasive Plant Database and learn more.